Due to an error in a crucial script for turf damages, today there was a backlog of up to 3 weeks. We are sorry about this and will make sure that it does not happen again. Things will return to normal after today. Ever wanted to see the people who you talk to on Street Crime? Here’s a perfect chance, Street Crime now has its own Photo Album for players to submit their pictures to. If you submit a picture which follows all the rules outlined and your picture is accepted you will receive 200 prestige points. Please ensure you follow the rules outlined on the Photo Album page to ensure that your picture is valid. Tonight at 19:00 game time today we will open up 3 new crew slots, first come first serve. If you have been wanting to start a crew for sometime this could well be your opportunity. Malaki has just announced his retirement from Street Crime and therefore the Helpdesk team. We would like to take this opportunity to thank him for all his hours of hardwork and dedication towards maintaining the game and aiding players in Street Crime. Today will see the release of a new feature Trade in which players can trade various items between each other securely. The trade feature was created due to the short full with Auctions and several comments regarding the legitimacy of other players when trading crews and items. Trade allows you to be totally secure when trading items as the trade cannot be altered once locked in. 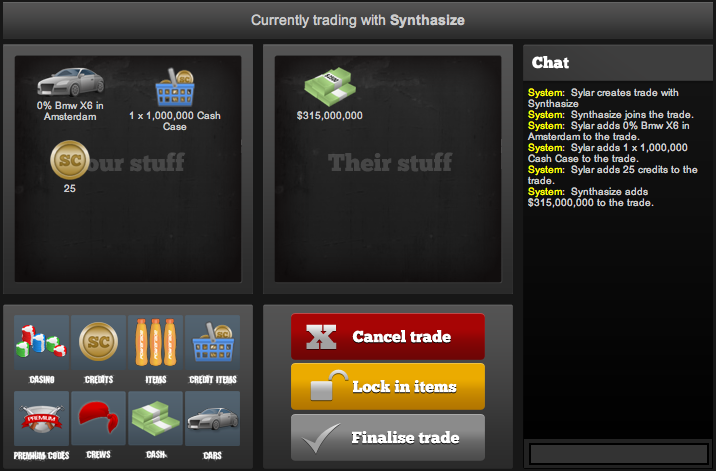 Trade allows two players to trade Casinos, Items, Credits, Crews, Cars, Credit Items, Money and Premium Codes securely. A player can initiate a trade with another player, who if agrees, can begin to trade various items with each other. There is a chat facility within the trade which allows you to discuss the trade with the other player to ensure you can negotiate and come to an agreement. Once each player has add their items to the trade they are required to lock their items in so that no further changes can be made. Once both players have locked in their items the trade must be finalised, only then will the items added to the trade be exchanged. I would like to take this opportunity to personally apologise for the downtime and problems this weekend with street crimes server. We work very closely with our hosts at all times to try and keep providing a better service, however our hosts are still in the early stages of developing their network systems so from time to time encounter problems. Every time a problem occurs it is fixed and counter measures are taken to make sure it does not happen again. Thus hopefully eradicating all future problems. If you would like to always be in the know when our server goes down about whats going on you can follow fubranoc on twitter. If our server is down and it is not a planned event ie if we have said nothing about the downtime, the likelyhood is something has gone wrong at our hosts end not ours. Although we do always try to keep this to an absolute minimum, sometimes the un-expected can happen and our hosts will suffer a problem of which it is out of our hands to fix. Things we will be taking extra precaution on in the future. Within the next few weeks we will migrate the game to a new server platform, which should not only be more reliable but also quicker too. We are going to start taking much, much more frequent backups of the game. (This may result in a daily downtime of a few minutes while the backup is taken to begin with). Both us and our hosts will be more prudent when recovering from downtime to make sure nothing is going wrong before making the game live again to the players. Hopefully all the problems and issues arising from this weekends interuptions have been ironed out now and you will accept our apologies so we can all look forward to a better future. You are currently browsing the Blog « Street Crime Game blog archives for May, 2010.